Mother’s Day makes me think of memories of my mother baking in her kitchen. She would either be baking a cake (our favorites were German Chocolate and Pineapple Upside Down Cake), her specialty teacakes, cornbread or dinner rolls. Dinner rolls that divided in the middle or the ones that had three sections were my favorite kinds. Bread was my weakness, especially bread with butter. Butter melted in a hot roll was as good as dessert – almost. I think my parents must have liked the cornbread the best, though. We had cornbread in chicken and dressing, casseroles, baked in iron skillets, crumbled up in milk or buttermilk. That is, with one exception. All the family tried the crumbled cornbread in buttermilk except me. Daddy tried to convince me to drink buttermilk. One taste is all I could get down, and that was more like gagging than tasting. But I did have the cornbread in a glass of milk. That was not so bad. Somehow, though, it’s not a snack I terribly miss. MaMa Arzelia baked cornbread the way I liked it. Her special recipe included a tablespoon of sugar. Using a tablespoon of sugar with certain foods must have been a family thing. Her youngest sister, Ruth, taught me that English peas (sweet peas) taste better with a tablespoon of sugar. These day I’ve learned that bread makes me feel bloated unless it’s gluten free. Where there’s gluten, inflammation is bound to show up somewhere like with leg pains at night. You can feel excruciating pain in the whole leg just by lightly touching a pressure point of the pain. Is it worth eating bread then? That’s a decision you have to make yourself. I choose to eat bread occasionally, maybe two or three times a week. Seriously, I love bread. I had it growing up, and it stuck with me. Pancakes, waffles, or biscuits for breakfast. Sandwich for lunch. Rolls with dinner. Bread three times a day. Not a difficult diet at all. Since I don’t dare allow myself bread that many times a day, I do without it most of the time and save it for Fridays or the weekends and occasionally during the week. Bread is a comfort food and makes me think of fond memories in my mother’s and grandmothers’ kitchens. 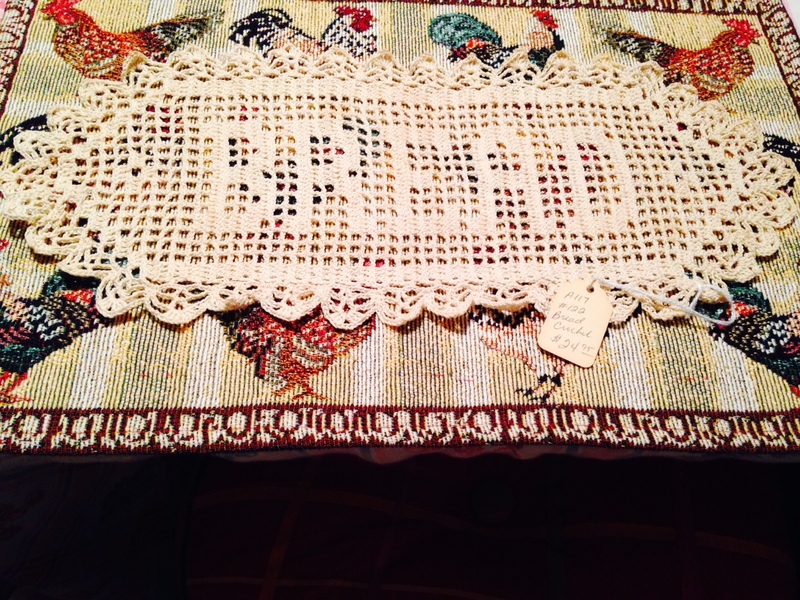 That’s why I saved the “Bread” crocheted piece my mother had tagged to sell in her booth at my sister-in-law’s craft mall. I saved the piece with the tagged left attached. A special memory. Either Mother crocheted the piece, or my aunt did. They both knew how to crochet. It’s a kitchen heirloom, a piece of comfort now kept in my own kitchen. This mother’s day, I was really missing my mom. Like yours, she was always in the kitchen and baking. I always associate pies with my mom. She loved to make pies. She also made excellent buttermilk biscuits. When my husband and I would drive up to see her when the kids were little, we would load them in the car in their pajamas before sunrise. They would sleep most of the way there, and she would have breakfast ready and waiting for us when we arrived. There was always a pan of freshly baked biscuits that we would have with real butter and home made jam or jelly. That makes me think of my mother having biscuits ready. She liked to fix biscuits, eggs, and bacon when all the family came for holidays, especially at Christmas time.